Felt inspired to do a new show this morning and keeping to the format of one discussion topic (roughly 10 minutes) and then Winners and Losers, Rant of the Week, listener comments/questions etc. In this episode, I discuss the imminent Bezos divorce and what that will mean for both Jeff Bezos and the future of Amazon. In Winners & Losers, I give the American Egg Board the +1 for @world_record_egg's successful attempt at dethroning Kylie Jenner's most liked Instagram post ever. The irony of course is that they probably don't even know about it! My loser is Mastercard for their groundbreaking new logo and what this says about them and their future. Listen direct here or subscribe here. Will Apple pay the price for innovating too slow? September 7th is the BIG day! For what you may ask? The announcement of the new iPhone 7, dummy! I guess the real question is whether we care anymore. Or maybe we care too much and just have lost faith with Apple to wow us with the kind of form and function that changed our lives and even the world with the initial launch of the iPod and ultimately iPhone. So apparently, the force touch of the 6s didn't exactly set the world on fire. Shocker! What about the other features? I guess the bigger screen coverage is pretty cool although I do like the tactile feel of being able to press a button and have it perform the functions of a button. I'm not sure about the disappearing headphone jack...I absolutely welcome a world of no wires (I probably spend 2-3 hours a day untangling my current headphones); I'm just unclear about the practicality of sticking a bud in my ear and what happens if it falls out...the white wires serve that "safety net" function in a very low-tech way. I actually think our friends at Samsung have done an exponentially (arguably explosive) better job at out-innovating Apple when it comes to mobile phones. From screen coverage to screen curvature; from retina scans to the stylus option; from wireless charging to wider lenses for selfies. ...but perhaps the one feature that to me becomes the killer app is a phone that doesn't break when you drop it and doesn't fritz when you spill water on it. For me, my nails on a chalkboard moment is seeing self-respecting professionals walking around with a screen so cracked it looks like someone hurled a rock at a mirror (and is subsequently enjoying bad luck as a result). That accolade belongs to the Droid and Android OS. Also, before we give too much credit to Samsung, they just recalled 2.5 million (yes, 2.5 MILLION) Galaxy Note 7's, so one step forward, one step back. To that end, small businesses (startups if you like) have mushroomed around the service and repair friction associated with smartphones. Replacing your cracked screen or impotent battery is now truly "better, cheaper, faster." The iPod saved Apple in my opinion. And the iPhone built on this success. Apple opened the walled garden associated with the iPod OS to welcome in the Microsoft Windows nerds and benefited greatly from the halo. They essentially swapped the walled garden of a device for an entire ecosystem. Right now, features like Airplay make interoperability a dream, but what happens when someone emulates, imitates or makes it likewise just as easy or even easier. Can we see a day where Apple everywhere is replaced with Amazon everywhere? We would be foolish to say no. Back to Jobs. His arrogance was endearing. In his void, any remnant of arrogance is just annoying. Isn't it time for Apple to start listening to its fanboys and girls? Ask us what we want. Or maybe it's OK if Apple looks to the competitive crowd and honors the adage, imitation is the sincerest form of flattery. Not to belabor the point, but PA-LEASE can we make screens unbreakable...or at the very minimum, less fragile! So no to point 10, but maybe or yes to the title of the article. Galaxy Note 7 recall costs Samsung "heartbreaking amount"
I was keynoting at a Satmetrix (the Net Promoter People) customer experience conference earlier this month in London -- and over fish ‘n chips during lunch, I ended up chatting with one of my fellow keynoters, Ian Williams (@CustExpMan), about making mistakes. Ian had a rather controversial point of view that organizations should go out of their way to make mistakes ON PURPOSE. I immediately thought of Apple versus Microsoft. While the former seemingly makes mistake after mistake (remember AntennaGate?) and seemingly gets away with it every time, the latter -- in an effort to be perfect to market -- gets vilified for even the tiniest deviations from the norm. In the startup world, there is a popular saying: “Done is better than perfect.” This statement speaks to the ability get a release in the market warts and all, as opposed to obsessing on ironing out all glitches and gremlins before allowing consumers in. Failing fast, embracing failure, pivoting and “iterating, iterating, iterating” are all healthy signs of life in the entrepreneurial world, but how does this translate into the corporate world of innovation? Or in this particular case, the world of customer service and customer experience? Furthermore, what about the ability to purposely make mistakes? It’s one thing to make a mistake (that’s why they call it a mistake), but when this is deliberate, surely it falls somewhere on the continuum of corporate sabotage to corporate insanity? When I’m asked what makes a brand social, or how a company can become more social, I talk about R.E.A.C.H., an acronym (hey, I’m a consultant) for responsive, empathetic, accessible, connected and HUMAN. What is it to be human? Corporations aren’t human, but their employees are. Brands are not human, but they are symbols that reflect the beliefs, ideals and philosophy of the founders, leaders, employees, partners -- and customers of the company it keeps. The Starbucks promise is that if you aren’t absolutely happy with your drink, they’ll make another for you. That’s their assurance to you if the barista at the register, the one with the Sharpie or the one that presses the buttons at the machine, isn’t always on top of his game. If it is true that “to err is human, but to forgive, divine,” surely this is a sign to empower our front line to make more honest mistakes. Humans aren’t perfect, and it is precisely this imperfection that endears us to one another. Surely our customers would be the first to recognize this. Surely empathy works both ways. I saw a stat that shows that companies who aren’t able to sufficiently solve a problem, but went about it in a genuine, compassionate way, scored higher net promoter scores than companies who did solve a particular problem, but did so in a rude, uncaring or abrasive way. That’s an incredible insight into aptitude versus attitude. In a world where we punish our customer service agents if they spend too much time on the phone, what if we rewarded them based on how many times they messed up? What if we incentivized our people based on their ability to volunteer times they were prepared to take a chance to tackle a challenge, versus handing it off to the next in line? And if they were to fail, celebrate and encourage them to share the learnings and insights that have the potential to iterate, evolve and grow with the entire company? Of course, I recognize the irony that if one sets out to make a mistake on purpose, it isn’t a mistake at all, is it? Which is in of itself… perfect! Photo Credit here. Original article here. My latest MediaPost Online Spin column below, which introduces a concept about "earning" versus "commanding" a bundle of products or brands. Whether you're Panasonic, Nike, Apple or Procter & Gamble...this notion applies. A month ago, Procter & Gamble announced it would be culling about 90 to 100 of its brands globally, in a restructure that would instead focus on the company’s top 70-80 brands. On the surface, the move makes complete sense. After all, the remaining brands have accounted for 90% of sales and 95% of profit over the past three years. So if I read that correctly (and the math is rather simple), we’re talking about 90-100 brands responsible for 10% of sales and only 5% of profit. If that’s the case, one might ask what on earth the company was doing in the first place carrying so much dead weight relative to the remaining rock stars. Or perhaps you were astounded by the tremendous lopsided contribution of sales and margin within the family of brands. You shouldn’t be, as your own customer base is probably not that radically different from this kind of 80/20 split. Certainly this is true within the B2B world -- and although less so in the B2C space, I wonder what Zappos, Starbucks, Amazon.com or Coca-Cola would say when it comes to their power products. So back to P&G and the announcement, which came from Chairman and CEO A.G. Lafley, who himself had returned to the company 14 months prior to steady a rather behemothic ship. Lafley had indicated disappointment with the company’s financial situation, and this move was a decisive step to get things back on track. And yet, I didn’t interpret any strength in this move at all. To me, it was all about consolidating the status quo; the known versus unknown; the “safe bets” or sure things versus the wildcards or anomalies. I would contend that there are no sure things or safe bets nowadays. Just look at the threat Dollar Shave Club presents to the incumbent, P&G’s Gillette brand. My gut feeling is that P&G’s brand-cutting move will be followed by a tried and tested approach, including mass/paid media and reach-heavy digital or social plays like Facebook, and doubling down on massive global sponsorships like the Olympics, as opposed to riskier and less proven approaches on the innovation front. In my previous startup boutique, I did some work with Panasonic. I recall how excited execs were about an SD card that could be interchanged and used in all their devices, from camcorders to cameras to HD TV’s to their Toughbook P.C. They believed that this interoperability (or compatibility) would be key to developing an unequivocal reason for consumers to choose every product within Panasonic’s portfolio. I remember telling them to “earn the bundle,” not “command the bundle.” Instead of creating a walled garden or closed system, let people decide for themselves what to use, and based on your great functionality, service and experience, they would give you more of their hard-earned money and loyalty. If you think about it, the walled garden didn’t even work for Apple. And thankfully so, when you look at how many iPods the company subsequently sold to PC users. Nike “earned the bundle” with me. I started with the obvious pair of shoes and hodge-podged the rest of my outfit from every other brand. Today, my shoes, socks, , GPS watch, shirt, shorts, windbreaker, gloves and hat are all part of the earned “Just Do It” bundle. Instead of cutting brands, why wouldn’t P&G have looked to invest in its existing suite, creating creative, lateral and bold pairings or partnerships, bundled around “reasons to behave” versus “reasons to believe.” Like P&G did with Potty Palooza during frigid Times Square days, with Duracell (charge your phones and cameras) and Charmin (go to the loo). Or what Charmin did with its Sit or Squat acquisition. Although truth be told, we still haven’t seen this live up to its potential -- for example, a tour de force combination of Always, Pampers and Charmin owning the public restroom for entire families! As the old saying goes: "If you're digging yourself into a hole, the smart thing is to stop digging.” Personally, I would choose to earn the bundle from a much larger portfolio of everyday products, as opposed to commanding the bundle from a smaller set – which no doubt will be under even more financial scrutiny, competitive pressure and startup disintermediation in the future. Last week, I popped into my local Apple store for back-to-back-to-back appointments with the Geniuses (or Genii) at the Bar. First port of call was my own iPhone and its radical draining battery. Turns out the problem was my 17,000 apps independently calling for “background app refresh” and “location services” all at the same time. Problem solved, one for one. Next up was my daughter’s beyond-smashed and dysfunctional iPhone. This is when things got hairy. I was told it would cost $199 for a new phone. I explained I had AppleCare and they acknowledged this, but informed me that my two-year warranty had expired. Enter the worst bait-and-switch in the history of not-so-smartphones. Obviously the idea is to get people to upgrade to new phones. In this case, my daughter’s iPhone 4S could easily have been upgraded to a 5 or 5S (with Two-year contract of course), but as it turns out, she -- quite understandably -- is holding out for an iPhone 6. Why not? Why wouldn’t you inform your own people when your overdue phone is ready? Why constantly trade on innuendo, hype and secrecy? That’s soooo Steve Jobs-era and 2011! After switching Blueshirts three times and apparently talking to the store “manager,” I found out that I could purchase a phone for $199 and then trade it in when I was ready. At today’s rate, I would get $125 for the phone. But a) the rate fluctuates daily (I’m a day trader now? ), b) the phone would have to be in pristine condition (did I mention, this was for my teenage daughter?) and c) I would have to use the store credit for a new iPhone from the Apple store. The problem here is that Apple is being out-innovated (outsmarted?) by AT&T and the like. AT&T now has “Next” that allows customers to swap out old phones (defined as older than a day) for the latest and greatest with two provisions: 1. The “lease” renews and 2. It has to be done in an AT&T store. That’s AT&T 1, Apple 0 for those keeping score in-store. To make matters worse, I explained to “the manager” that I was literally (my third appointment that day) about to purchase a new MacBook Air and spend up to $3,000 in the process in their store, making it the 11th active i-device in my household. Yes, there is a “kick me” sign on my back right now. You would think the manager would be “empowered” to make me an offer. How about meeting me halfway at $100? Nope. How many people were in the exact same situation as myself, do you think? I didn’t have to think for too long. There was one person sitting right next to me with the exact same problem: a horribly cracked iPhone 4S screen, waiting for the 6, and oops… expired AppleCare. How many tens, hundreds, thousands of people are walking into Apple stores every single day experiencing the exact same poor customer experience? The mind boggles. It would appear that innovation -- or rather, the lack thereof -- has a value: It’s $199. When multiplied by tens of thousands of dissatisfied customers, that comes at a rather steep price. Those of you who don't subscribe to Shel Holtz and Neville Hobson's For Immediate Release are probably still blissfully living underneat the rock of ages where 4-color bleeds, mechanicals and 30-second spots reign supreme. For the rest of you, you would know FIR is one of the longest standing P.R. and Communications podcasts out there. Period. And the best. I also had the pleasure of working with both Shel and Neville during the crayon days. You can listen to the post directly here (or if you're subscribed to Across the Sound or Jaffe Juice podcasts, it will download automatically via iTunes). The very thoughtful post on the podcast can be found here. If you're still interested in reviewing the book, I'll send you a copy. Let me know. Tags: "30-second spot", "For Immediate Release", "Joseph Jaffe", "Maarten Albarda", "Marketing Podcast", "Neville Hobson", "Shel Holtz", "Thought Leadership", "Z.E.R.O. ", "Zero Paid Media", "ZERO"
A month after the book launches, I'm finally getting to the blog post about my 4th book, which I've co-authored with my former client and current friend, Maarten Albarda. What I have been doing is writing Online Spin on MediaPost bi-monthly. It's been just over a year now and I'm happy to announce that I'm moving to the "Lead Off" position on Monday's, alternating with Maarten, who makes his debut next Monday. Most importantly, Z.E.R.O. marketing is all about slow burn and long tail. It's about using existing customers to gain new ones. It's about utilizing customers and advocates in innovative ways, leveraging existing assets as opposed to piggy bagging on the borrowed interest and/or equity of middlemen. 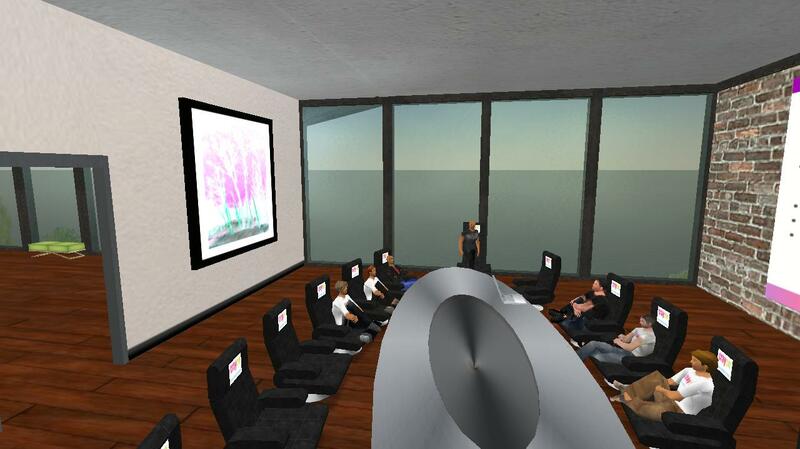 In Z.E.R.O., our position is that a perfect storm is coming…in fact it may already be here. To make this case, we introduce several key arguments: business, economic, consumer, media and creative cases – any of which could – by itself - be enough to be the straw that breaks the camel's back, but when combined presents a perfect storm scenario. Our central premise is that if media inflation continues to outpace and run away from economic inflation, the bottom may fall out the media model. Put simply, it will become practically impossible to maintain minimum acceptable levels of reach, frequency, share of voice and presence in the marketplace. Our solution for this eventuality is the Z.E.R.O. Manifesto, which holds that in a perfect world, the optimal paid media budget would be zero. In other words, brands would not need to spend a dime on paid media, because they would have enough customers; enough word-of-mouth; enough rabid fans and advocates; enough referrals; enough partnerships with entrepreneurs, startups and technology investments; and last but not least, enough assets to activate, amplify and monetize. What is an asset? Your people. Your products. Your packaging. Your clothing. Your billboards. Your trucks. Your stores. Your website. Your content. Talk is cheap. So many books outline a problem, without putting forward a solution. Section 3 introduces a 10-point action plan, which presents 5 ways companies can implement Z.E.R.O. Internally (Cultural, Organizational), as well as 5 ways they can truly bring Z.E.R.O. to life externally (Strategic, Tactical). From compensation to budget setting; from flipping the funnel to innovation. It's all inside. Whilst the Z.E.R.O. Vision is for brands to shift from being tenants (renting media) to landlords (owning assets), the "hidden message" here is the paid media will continue to exist (after all the world is not perfect), BUT it shifts from being the "go to" first port of call or star of the show to the final piece of the puzzle; a topper up or co-star / supporting member of the cast/ensemble. That's a significant shift as is the call-to-action for brands to audit their connections and ultimately strive for a 50:50 mix between direct:indirect (assets:media) by 2020. And now comes the part where I ask for your help. Buy the book. For yourself. Your clients, colleagues, partners, superiors, subordinates, friends, enemies, frienemies! Please review the book on Amazon.com, BN.com etc. Going back to Life after the 30-second spot and Using New Marketing to Prove New Marketing (UNM2PNM) which is very keeping with the Z.E.R.O. theme, if you agree to review the book, I'll send you a copy with my compliments. Maarten and I know that this book will leave a lot of people very uncomfortable, but it's tough love at worst and a game changer at best. Maarten and I put it this way: if we're wrong about this, you're a winner because you diversified your portfolio, you retook control as a marketer and you invested in your customer...but if we're right about this, well then you just obliterated your competition, potentially changed the game and who knows...perhaps transformed marketing from a cost center to a revenue generator. Maybe you even discovered the next Snapchat, GroupOn or Instagram in the process. So if you haven't done so already, please give Z.E.R.O. a try. Based on the reactions we're getting from brand marketers who have embraced #zeropaidmedia already, you'll be glad you did! Be a hero. Commit to Z.E.R.O. Paid Media: it would be so much easier if only robots were on twitter. I recently sat down with fellow Wiley author, Jay Baer, who co-authored The Now Revolution with Amber Naslund. He's now gone solo and written a book called Youtility. In Life after the 30-second spot, I wrote about R.U.E. - Relevance, Utility and Entertainment (which I would now rename as - Customer - Experience). Now Jay Baer has written the definitive book on Utility. What a novel idea…brands actually being useful! Bravo! Here is our conversation, which you can download or listen live by clicking this link. And as a reminder, you can purchase his book here or visit his incredible book's website, which offered tremendously valuable...UTILITY....and THEN purchase the book. Subscribe to the podcast via iTunes here for more interviews like this one, as well as my monthly debate with fellow author and thought leader, Mitch Joel. Q-and-A: Why it's better for marketers to be "useful" than "amazing"
It's like Attack of the Killer Tomatoes, but much scarier, especially if you don't know what you're doing with respect to dealing with "backlashing" customer. Fortunately for you, author Paul Gillin, who - along with Greg Gianforte - wrote "Attack of the Customers' does know a thing or two about the emerging space. Purchase the book on Amazon.com here. In this Jaffe Juice podcast conversation, I spoke with Gillin and you can listen via streaming or download here. We have a lively discussion about whether this is attacks or just overdue customer activism, how to deal with customers in a public space. Whether customer attacks are premeditated and much more. PS Our friends at JCPenney could probably take a leaf out of this book! My good friend and ex-client, Maarten Albarda and I are co-authoring a book together. It's my 4th book (after Life after the 30-second spot, Join the Conversation and Flip the Funnel) and Maarten's first. Besides sharing the same vision and passion for the subject, we're bringing a 1-2 punch to the table in the form of advertising-agency perspective on the giant elephant in the room: media or rather paid media. The book is called z.e.r.o. 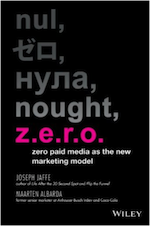 and the sub-title, "zero paid media as the new marketing model" kind of says it all (and in less than 140 characters). On one hand, it's me returning to my "Life after" roots, but on the other other (and more poignantly), it's our set up of our premonition of a perfect storm approaching in marketing; one in which the bottom could conceivably fall out of the media model. Fortunately, the world is not perfect and change takes longer than we expect, but then again...just look at how your world has changed in the past few years to validate the fact that sitting and doing nothing is not a viable solution. We're kickstarting this revolution and here's how you can play a key role. Review the various pledge rewards and become a backer. We've named them after famous misers. We just pre-launched the book and Kickstarter campaign at the Festival of Media in Montreux, but here's the crazy part...in just over 24 hours after I hit the publish button (in stealth mode), we've almost hit our initial funding goal of $10,000. With your help, we'll push this over the edge and see how far we can take it. The wild thing is that the book will become it's own case study insofar that it will demonstrate how we were able to self-publish our book for "z.e.r.o." by tapping into our advocates and leveraging our owned assets. It's U.N.M.2.P.N.M. circa 2005 retooled for 2013. And all things being equal, Z.E.R.O. will launch in September of 2013 and will contain the 10-point action plan towards implementing this bold vision towards helping marketing evolve, normalize and allocate scarce resources to a re-prioritized hierarchy of connection points. If you would like to make contact with me, please see the About page. to the reincarnated and reinvigorated Jaffe Juice. What was once a weekly op-ed column is now an unshackled, uncensored and uninhibited dialogue on the subjects of new marketing, advertising and creativity. anybodyask on The 100 Day Challenge: Are you Marketer enough? Jaffe Juice #188 - Call me, Maybe? Disrupting Innovation - A New Course at Reed College of Media taught by me!